Kitchen is a Magic place, where yummy Food adds Joy to life. Life in the Kitchen is fun and rewarding, why not do it in Style. Happy surfing here for the food recipe, perfect Kitchenware or kitchen Gadgets, happy cooking, play with green vegetable and learn to laugh at your not so perfect dish. Working so hard for the past few days, so you gotta a reason to buy yourself something luxury, something you wanted so long to give yourself a little extra bonus, for me, it's a classic shaped tea set, made in China porcelain, very fine quality porcelain that made me love at first sight. 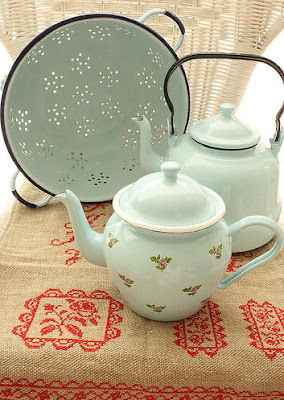 The table cover along with this tea set is so beautiful too, the color, the patter, so in shape and perfectly fit together as a whole. It really makes my relax time more enjoyable with a cup of green tea, instead of regular coffee, in fact, green tea got many benifits more than coffee, so giving yourself a great tea time once in a while is a great idea and healthy lifestyles too. With all thease tea gadgets ready, what left with you is the tea making skill, the culture in it and the feeling. It's not jut simple as putting a few tea leaves there and add water, it's more than that, so why not learn more about Chinease tea culture, to understand the tone with all this style and feeling, all the tea set design, to enjoy better the green tea. I keep my curiosty and inner sunshine with me. Never push myself too hard to enjoy the joy of life. I always believe that a healthy diet and enough sleep is the best way to keep beauty with you. Don't ever be lazy again since Youth is left so little to waste around. Valentine's Day Wine, What along with Chocolate?